When Statoil entered the offshore wind arena with their Hywind Scotland project, we knew they meant business. When they changed their name to Equinor, some said they were looking for ‘just a green’ image, but this time too they were serious about their intentions. Their mission statement indicated they would make their overall energy production efforts cleaner, add to and drive the energy transition to renewables, and become a main player in Floating Wind as much as they are in O&G. Equinor today announced they plan an 11 FTU (floating turbine unit) floating wind energy farm between their Gullfaks and Snorre fields to power the five O&G platforms that produce the fields, which will significantly reduce the CO2 footprint of those operations. The fields are located in the Tampen area some 125 km offshore Norway in the Northern North Sea in 200m of water. 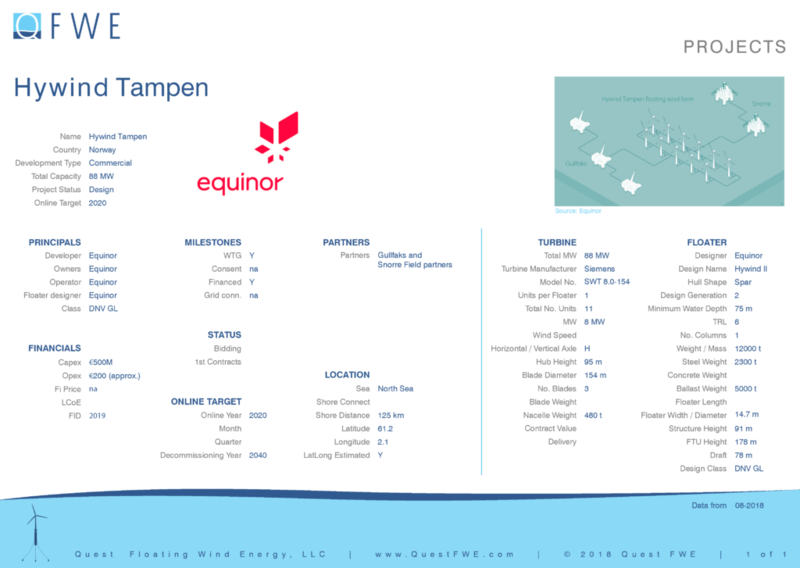 The Equinor Tampen project will see 11 Hywind floaters, probably a further design optimisation of the Hywind II floater currently operational in Scotland. Each unit will carry an 8 MW turbine. What Will Float in South Korea’s Newly Announced Project?